Karaganda State Technical University, Department of Technology of building production, Speciality “Construction” (1979-1984). 1984-1986 – Laboratory Assistant – Central Processing Factory “Saburkhanskaya”. 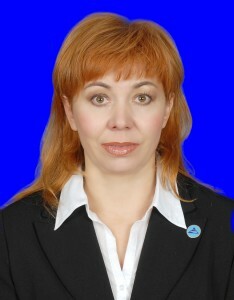 2010-present – Assistant Professor of the Department “Technology of building materials and products”, now the department of “Building materials and technology” KSTU. “Finishing materials”, “Concrete modifiers”, “Use of industrial waste in the production of concrete and ceramic materials”, “Standardization and metrology in the production of building materials”, “Quality management of non-metallic materials”, “Modifiers of concrete and ceramic materials”, “Modern materials based on local raw materials”,” New types of finishing materials”, “Basics of scientific research”, “Computer-aided design of technological processes”, “Building materials”, “Synthetic (man-made) construction conglomerates”, “Modified Concrete”, “The methodology of scientific research”. Published more than 60 publications, has 2 innovative patents of the Republic of Kazakhstan, 3 Certificates of State Registration of Rights to the Object of Copyright. - Proceedings of the University – Karaganda, 2018. – №2. P. 78-82 “Development of the composition and method of production of effective materials on a hydrophobic binder for low water demand”.